It is so nice to hear a new LP by Jaire. 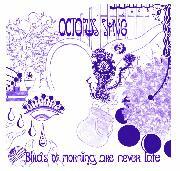 For those not familiar with Octopus Syng, it is basically a one man band project like Nick Saloman’s Bevis Frond, where Jaire records all the instruments himself. He has a few guest vocalists but he does all the lead vocals. This new CD has a really nice, happy, summer folk rock vibe and some really great songs with funny lyrics. Jaire also does all the artwork himself as well. A real one man project.. Jaire is cleary inspired by Syd Barrett and may be compared to people like Reefus Moons or Robyn Hitchcock as well. I think he has something quite different and unique from these UK folks… The first song is a beautiful and happy summer folk song. Square Tragedy is one of the only real psychedelic tracks on the CD and really great. Jaire should do more stuff like this. One Brunette Girl features more electric guitar. Life is so Simple goes back to the voice, acoustic guitar and bass…Very stoned singing in this one. Nice. Bright Trees and Symbolic Keys is a psychedelic rock track and shows yet another side of this unique Finnish guy and I love the female vocals at the end. The CD ends with another acoustic track but perhaps more for winter rather than summer… Another very successful record….